Back when I did my student teaching, I could never remember to check my mailbox. You know, the one in the staff room—where you get all the little fliers and notes. At that point in time, email wasn’t used for communication quite as much as it is now, so I REALLY needed to check that mailbox!! A year or two into my teaching career, I realized why I could never remember to check that darn mailbox: brain overwhelm!!! Pardon my very non-scientific language, but your brain only has so many “slots” to fill with to-dos and things to remember. When you’re learning something new (which in my case was learning to teach), so many of your “slots” are filled up. During student teaching, for example, so much of your attention is taken up by thoughts about how to get the class to stop talking constantly, what lesson you should teach for your observation…and the list goes on. So why do I bring up this story, you ask? 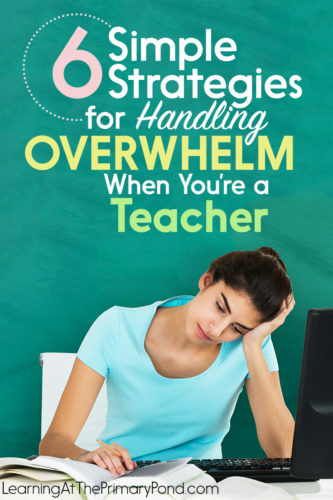 What does this have to do with the topic of this post, teacher overwhelm? Well, even if you’re not student teaching…even if you’ve been teaching for many, many years…you still have limited “brain space” or attention. Teaching requires so much decision-making and remembering things. There are always SO many items on our to-do lists. BUT (if you’re like me), it still feels like there’s too much to think about, too much to remember, and too much to do. And THAT can lead to overwhelm! There are many great things about teaching. But feeling overwhelmed can be one of the worst parts, in my opinion. So in this post, I’ll share 6 strategies that help me cope when I’m feeling overwhelmed! 1. Recognize overwhelm for what it is: a feeling fueled by thoughts. Our thoughts lead to our feelings. Those thoughts can easily lead to feelings of overwhelm or anxiety. Personally, it’s very easy for my thoughts to get away from me. I have to consciously rein them back in and reframe them to become more rational. When you reframe thoughts like this, it’s not that you need to LIE to yourself. You want to be completely honest with yourself, but focus on being rational instead of emotional. Reframing your thoughts sounds like such a little thing, but it really is powerful! When you are thinking more rationally and calmly, feelings of overwhelm will (eventually) begin to disappear. In a nutshell: pay attention to the things you say to yourself in your head. They matter! Reframe your thoughts to be more rational, and it’ll change the way you feel. 2. Distinguish between wants and needs on your to-do list. It’s funny—in the classroom, I’ve taught my students about “wants and needs” just about every school year. But when it comes to my own to-do list, I’m TERRIBLE at distinguishing between wants and needs! For example, let’s say that I plan to introduce inferring next week. I’ve found a really fun, engaging lesson online. I write down all the different steps to prepare the lesson on my to-do list. When it comes time to prep, I’m pressed for time. It’s Sunday night at 7pm, and I have lots of things left to get ready for Monday. But I feel like I HAVE to prepare this inferring activity, because it’s already on my to-do list. But really, that’s kind of silly! If I’m feeling overwhelmed, I can just find a couple of interesting photos online and use them in my inferring lesson. I can spend 5-10 minutes getting ready, rather than an hour and a half. The next time you’re looking at your to-do list and feel overwhelmed, ask yourself, “What’s ABSOLUTELY necessary?” It’s so easy for us to believe we *have* to do certain things (when that often isn’t the case). We all want to do our best by our students. But a calm teacher with a simple learning activity is ALWAYS more effective than an overwhelmed, stressed-to-the-max teacher with the best activity ever. 3. First do a brain-dump, and then create a prioritized to-do list. This kind of goes along with #2, but I like to do a “brain dump” when I’m feeling overwhelmed, and THEN I rearrange the list items and prioritize things. When a ton of thoughts are bouncing around in my brain, I open up a blank document on the computer and type it all out. Then, I cut and paste to move things around. I can organize items into categories, or arrange them by the date when they should be completed, or prioritize items. There may even be a few quick things that I can get rid of right away—by doing them immediately! You can do this on paper too, but it’s easier to rearrange items when you do your “brain dump” on the computer. Ha, does that make you laugh a little?!? I know, I know, as teachers, we CAN’T focus on just one thing at a time! But when we’re learning or implementing something new, we really CAN focus on making just one small change at a time. For my first 4 years of teaching, I always felt burned out by early October. Why? Because I had spent the summer planning ALL of these new things that I wanted to implement in my classroom. And of course, I started the school year trying to do ALL of those things at once. It was too much, and it burned me out! When you learn something new or get a new idea, it’s so tempting to want to make a TON of changes all at once. And honestly, we are all coming from a good place when we do this: we want the very best for our students! But when it comes to managing overwhelm, taking one small thing at a time can be really helpful. Let’s say, for example, that your literacy centers aren’t going as you’d like them to. You want to change up your groups, change the procedures in a few centers, and add some new activities. That’s a lot, so just tackle one thing at a time. First, change your groups. See how that goes for a day or two. Then, teach new procedures for ONE center. A few days later, teach new procedures for ANOTHER center. Etc. Baby steps in the right direction are so much more powerful than giant steps that can’t be sustained! 5. Approach online teaching ideas and resources in an intentional, healthy way. The internet and social media are great for getting new teaching ideas. I have learned so much from other teachers’ blogs and online teaching resources! But it’s also a double-edged sword. We’re constantly learning new strategies, seeing new ideas, and reading others’ opinions about the way we “should” teach…it’s a lot! All of it can easily lead to feelings of overwhelm. So we have to be intentional about the way we approach these ideas. 1. Will this activity help me teach a skill in my curriculum, address a valuable social/emotional skill, or help me build relationships with my students? 2. Is this activity right for my particular group of students—their needs and interests? 4. Do I realistically have TIME to implement this idea? If your answer to any one of these four questions is “no,” then scrap the idea or save it for another time. But even if you answer “yes” to all of the questions, that doesn’t necessarily mean that you should try out the idea! There are SO many things that we COULD do. But we can’t and shouldn’t do them all—not in a single school year, anyway. So create a folder or a document on your computer for ideas that you love. You can always come back to them. Could you take one day a week—or most of that day—off? Completely unplugging is SO refreshing and can definitely help you manage overwhelm! 6. Celebrate the things that you DO accomplish and recognize the good!! When I’m feeling overwhelmed, many times it results from my own worries that I’m not doing a good enough job, or that there’s more that I *should* be doing. I think trying to improve our practice is a GOOD thing. But—for me, anyway—it’s so easy to focus on what I need to do or improve. Noticing the things that ARE going well doesn’t come as easily to me! Whether you jot down what’s going well in a journal or simply make it a point to notice three good things each day, celebrating your accomplishments (and your students’ accomplishments) is so helpful. I have no doubt that you care deeply about your students and their success, so don’t forget to celebrate all the great things that you’re already doing! While some of these strategies can be used “in the moment” when you’re feeling overwhelmed, many of them are things you can do all the time. For me, avoiding anxiety and feeling overwhelmed is something that I have to work at and manage consistently. Do you think any of these strategies could help you manage feelings of overwhelm? Or do you have any tips to add? Leave a comment below—I’d love to hear from you! So glad this was helpful, Leslie!! Changing roles definitely is a little like starting over. Alison, Thank you for this! 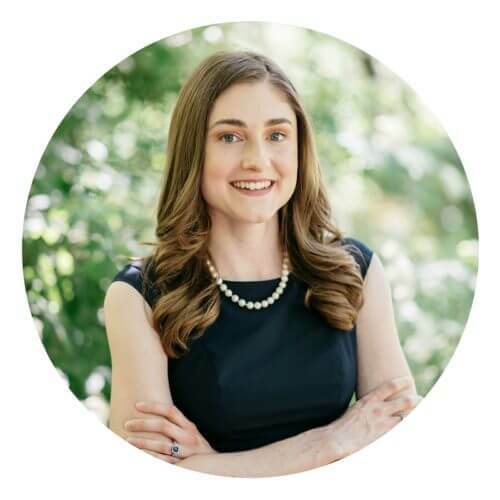 I’m a 26 year veteran first grade teacher and I’m completely overwhelmed by the demands and changes my district has made this year and in the past five. We always hear what we are doing wrong and unfortunately are not valued here in NY. I’m sure I’m not the only one to benefit from your reminders! I think very highly of you, your blog and your webinars. You are so organized and have a lovely way of presenting things. You are SO sweet, Elizabeth – thank you! I’m so glad this was helpful to you. But I’m so sorry that you are not feeling valued…I have been in the same position before, and I know how hard it is to do a challenging job on top of that. Super draining. But I bet you are doing so many wonderful things in your classroom. Your kids are lucky to have you and your experience!! So, so true, Karen! I think we are all harder on ourselves than anyone else is on us. Thanks for sharing this!! Thank you so much for these tips on dealing with overwhelm!! I️ really like your reframing questions idea. I️ hope to implement this week during my sub jobs! Not sure why but my iPhone can’t type that word. It turns it into a box. OMG I just wrote to you asking for advice on avoidance and putting off the things that aren’t on our “fav” list as a teacher. You have allowed me to say its ok to feel this and then take it one step at a time. Perfect timing then, Kathleen! It is a-okay to feel this way, and I don’t think I’ve ever met a teacher who doesn’t! Sending you hugs to Australia!! I am a 32 year veteran first grade teacher and have been more overwhelmed this year than those in the past. Thank you for this sharing these strategies. I really needed to hear them. It’s really hard to shut my teacher brain off and just relax. These strategies make sense! I plan to share them with my teacher friends. Oh goodness! That is a lot to handle! I hope you can find some peace soon. Take good care of yourself! !